A nice, lazy, weekend. Too damn short. Saturday, Tracy and I went up to Del Mar to eat at Board & Brew. Sunday, we went on a Hornblower Cruise. Pretty fun. 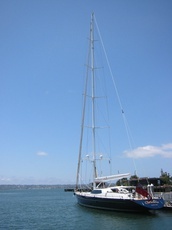 Got to see this gnarly 140 foot sailboat from New Zealand. And the USS Midway was down at the harbor too, getting prepped to open as a museum attraction on June 6th. Only $13! Got the Sysadmin Happy Hour pics up. That sure was fun. We were missing a few ppl, but for the most part, everybody showed. Good times. Found out that Obie works at ADN, where UnixMechanix keeps it's servers. I need to get him a job at QC, he doesn't like it at ADN and he's a smart dude. Found a really great link on how to install dual carbs in my Fiat: here. Looks like a lot of work. ..Speaking of which, I so don't want to go to work tomorrow.